My wife and I recently moved across country (north to south, not east to west) and I thought I'd share with you a little mishap we had at the very beginning of the trip. We had just sold our house, and closed on the day we were to embark on our journey, but felt that we needed an afternoon nap prior to departure. So, with our car packed full of our traveling essentials (clothes for all of us and toys for one of us), we headed over to the local Holiday Inn Express to get some shut-eye. Our plan was to leave late that evening and drive through the night so as to make the sojourn a little more bearable for Catchr. After checking into our room and investigating all the wonderful nooks and crannies (I love looking through all the closets and drawers in a new hotel room...I know, I need help), we decided to break out a couple of toys we had packed to keep Catchr occupied during just such an occasion. We had the typical blocks and stuffed animals, but we also fit into our car a toy that we thought would be the cat's pajamas for the hotel room. 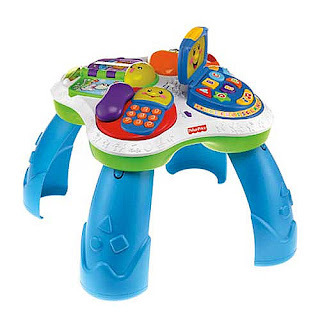 The Fisher-Price Laugh & Learn Fun with Friends Musical Table. Now this is no slouch of a toy. It runs around $40-45 and we had owned it for about 2 months (basically as soon as Catchr began pulling himself up to a standing position). And it did give him some incentive to pull himself up and play with all the buttons and lids. I say, "lids" because the little laptop computer's top opens and closes just like any hinged-lid laptop. And just like any hinged-lid contraption offered to an infant, Catchr smashed his hand/finger in the lid on one instance right after we bought it. He did not slam it hard, so we figured it was a fluke. Nope. After playing with his musical table for about 10 minutes in the hotel room (by now Catchr was very adept at standing on his own) he smashes his finger, not in the laptop, but under the turning page of the plastic book opposite the laptop. We kissed his boo-boo, assured him that the toy was full and would no longer be looking to devour his fingers and set to play with table once more. I proceed to bring in our luggage from the car, only to return seconds before Catchr let out a gawd-awful, blood-curdling shriek. That darn table was still hungry. This time Catchr fell victim to the laptop lid and his own body weight. Catchr is a pretty rough-and-tumble little boy and is ALWAYS doing product testing with his toys. As such, he was testing the strength/speed of the laptop lid, when he caught his finger in the laptop, up near the hinge. As most unsuccessful product testers do, Catchr had one hand on top of the lid and one hand on the surface of the table/computer. It was the thumb on the latter hand that got pinned, while the weight of his other hand (and now quivering torso) kept him locked in a death-grip with this awful contraption. "That's it. I'm done!" Those were the only words out of my wife's mouth as she disassemble the the toy and put a very warm and well thought out note on it, offering it to the hotel cleaning crew. I'm not sure if it's still in the room or not. But what I do know is that jettisoning that parental nightmare gave us a little more space in our packed Honda. As for Catchr, he had a nice purple thumb for the trip, but he got past it very quickly...again, he is a very rough-and-tumble boy.